What Are the Best Furnace Filters? Furnace filters are important, both for the comfortability of your home and the livelihood of your HVAC system. The furnace filter’s most important job is protecting the furnace from dust and debris which could have a negative impact on its performance and your utility bill. Finding the right filter doesn’t have to be complicated. Let’s consider some options. Most common filters are disposable, but there are also reusable and long-term options. Reusable filters are eco-friendly and are machine-washable or can be cleaned with water or a vacuum. Use the information in the chart below to compare furnace filter options. Certain filter types may provide you more value based on your preferences. *MERV, or Minimum Efficiency Reporting Value, is a grade between 1-20 that evaluates the effectiveness of an air filter. The higher the MERV rating, the finer the filtration. Some filters with a high MERV rating can drop air pressure in your duct system, which can increase energy bills and damage your HVAC system. For example, let’s say you have a pleated filter that’s 1-inch thick and has a 13 MERV rating. Because the filter is thin and the MERV is high, it reduces airflow into the duct system. And like we said before: low airflow = wasting energy. To make matters worse, this type of filter will reduce airflow even further once it gets dirty, which it will do very quickly. Because high MERV filters are designed to catch large and small particles and therefore will get dirty quickly. And since the filter is thin, the filter will quickly fill up with particles and block airflow. Disposable fiberglass and polyester filters are inexpensive and convenient. However, if maintained regularly, reusable electrostatic filters last approximately six to eight years and may provide more value. When using disposable filters, it’s important to replace them every few months to protect the performance of your HVAC system. The higher the MERV rating, the quicker the filter will get dirty. If you are remodeling or having work done in your home, replace filters more frequently. Disposable pleated filters block particles but electrostatically charged air filters do the best job filtering out small particles and contaminants like dust, allergens and smoke. If you have allergies or asthma, you may want to avoid disposable fiberglass filters. High-efficiency pleated furnace filters are particularly useful for individuals suffering from respiratory problems. For optimal performance, replace furnace filters regularly to prevent dust buildup in your HVAC system. If clean air is what you’re really after, we also recommend having an air cleaner or purifier installed in your air ducts. Air cleaners have a thick media filter that traps small particles like pet dander and mold without limiting air flow. Which Furnace Filter is Best for You? A filter we often recommend is the 3M Filtrete Allergen Defense Air Filter. You can find a two-pack of these disposable electrostatic filters for around $20, and they will keep your HVAC system running smoothly while improving air quality. This product is designed to pull in unwanted particles and help capture allergens like lint and dust. 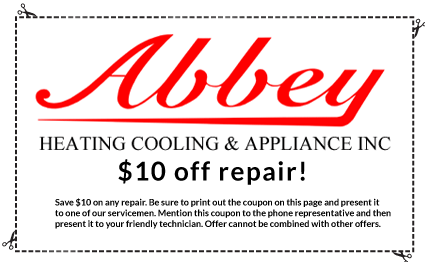 If you’re having issues with your furnace, or any major appliance in your home, contact the expert technicians at Abbey Appliance. Most repairs can be done same day, in one visit. Click below to receive $10 off your furnace or appliance repair.